Poor Thunder. S/he lived but two days in a shiny glass bowl in our laundry room. My eight-year-old, already wise to the whims of goldfish life, was adamant that he not reside in her room so she didn’t have to wake up and find him dead. Alas, she didn’t escape that fate: she’s still the one who found his little orange body floating upside down in the bowl. She blinked back tears. The betrayal was too much. 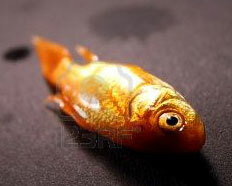 It had been only a few weeks since we lost Carly Jr., the goldfish she “won” at our synagogue’s Purim Carnival. Never mind that she didn’t actually get the ping-pong ball in the bowl; everyone’s a winner! She received Thunder as the “favor” at a friend’s birthday party. The mother had warned me that the gift might not appeal to everyone. “Does it make a lot of noise?” I asked dubiously, imagining a toy trumpet or a mini boom box that played only Miley Cyrus. “Nope, it doesn’t make any noise,” she assured me. She was right about that. Thunder was definitely a quiet pet. During the party, the girls had filled and decorated the bowls, then had a hula lesson while the fish acclimated to their new homes. When we drove Thunder home, we covered the bowl with Saran Wrap–and thank goodness, because when I turned the corner onto our street, the bowl tipped over. Thunder seemed fine, but perhaps one of the translucent blue rocks on the bottom had irreparably damaged her internal organs. Do fish even have internal organs? 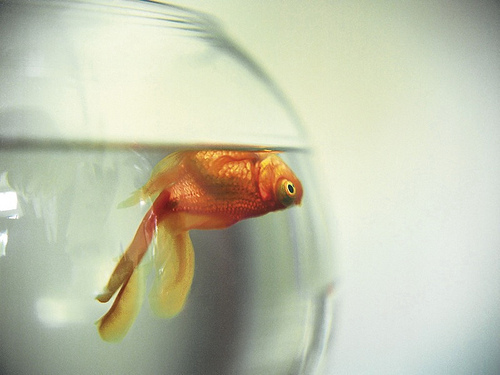 The only thing worse than killing off a goldfish is keeping it alive. Then you must regularly confront a bowl full of raw sewage on your counter. But we have actually found a pet that’s even less rewarding than a goldfish: a guppy. Or more accurately, two guppies, which is the number we inherited from my daughter’s first-grade classroom. In a matter of months, we had 15 or 20, and the less we cleaned the bowl, the more they proliferated. It became a little game between my husband and me to see who could tolerate the stench of the bowl longer before breaking down and cleaning it. Finally, I convinced my daughter that the guppy family would be happier if we “let them go” in the pond across the street. For all I know, there are now 10,000 of them flourishing there. On the morning Thunder passed, I happened to run into the mother who had bestowed him upon us. I tried to mask the relief in my voice when I broke the news. She looked stricken, expressed her regrets and then wondered if the fish had been fed too much. Perhaps–though I have never heard of a fish dying from eating too many flakes. (In one of my favorite children’s book, P.D. Eastman’s “A Fish Out of Water,” a boy overfeeds his goldfish, against the advice of the pet-shop owner. Otto starts growing, and doesn’t stop until he overtakes the town swimming pool, requiring the pet-shop owner to rush down and perform some sort of magic to make him small again.) She offered to replace Thunder, but I quickly demurred. This entry was posted in Cranky mommy blogger, Family life, Kids, Parenting and tagged goldfish, Pets. Bookmark the permalink. Remember when I was little, and I refused to flush my dead pet goldfish down the toilet? I felt too bad for them! I ended up burying all of them behind a big rock in our back yard.. Believe it or not, Flippy, our goldfish, also won at last year’s Purim Carnival, is still alive and apparently thriving. He (she?) wasn’t even recognizeably a goldfish when he first came home in a little plastic bag. Just barely bigger than a Junebug, he swam around a little Tupperware dish for months until we realized he was getting bigger. Eventually we gave in and purchased a small fishbowl. But after a while, even that was too small. Dare I say that Flippy could eventually take over our one bathtub! We too dread the day when he’ll be swimming upside down. But we’ve been able to go on a week’s vacation leaving just a food pellet for him and lo and behold, there he is, swimming around in cloudy water, seemingly no worse for the wear when we returned. Every now and then we tell the Rabbi, “the fish is still alive”, and he’s shocked. 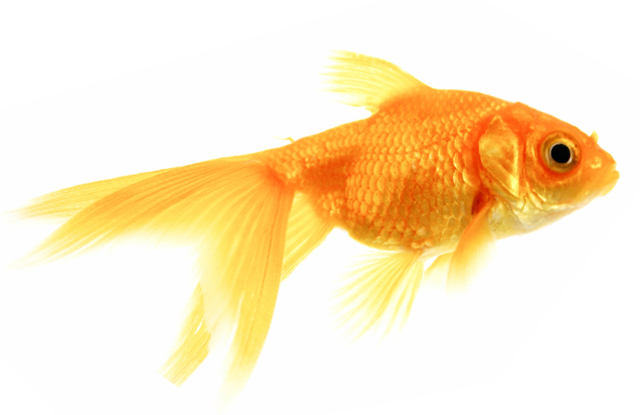 FYI, the reason goldfish die from eating too many flakes is supposedly because it makes them “excrete” too much, causing the ammonia level in the water to rise. I know, because I went online and did ALL the research when we got “Trifly,” our first goldfish. I then bought a filtration system, cleaned the tank regularly, and insisted on a strict three-flake per day diet, in addition to Poland Spring water for his tank (so that the pH level would stay a perfect 7.0). Trifly died anyway, as did Goldie and Swimmy after him. Our tank is in the basement, if anyone needs it. Okay this is brilliant and so funny. I’m so sorry, though, for sweet little what’s his name. I don’t even have enough energy for this goldfish to scroll up three inches and remember his bloody name!! anyway back to the point. I’m so sorry for him and I hope he/she meets in fish heaven Haley’s previous fish, Blue, whom, while cleaning out the bowl, Nate accidentally let slide into the sink and then into the garbage disposal don’t let Carly read this. ANYWAY, Nate tried really hard to fish Blue out. heh heh. He couldn’t. Or so he told us over the phone. So I guess your guy/gal won’t meet Blue in fish heaven after all. Can’t wait to read the next entry. You write like a dream, girlfriend. Having a goldfish in a bowl is like having a dog in a box! They need something bigger than a bowl and they are extremely smart and funny! I got 3 so far and they are just adorable!